You’re standing in the grocery store staring at the green peppers. To your left are green peppers. To your right are organic green peppers. But, both are green peppers, right? Is the organic one better for you? Does it really matter? What about whole wheat macaroni? Or, all-natural cheese crackers? How do you know what words are marketing gimmicks and what words are related to specific qualities or production practices? One way is through the food label. Food labels are created to inform consumers of the contents in the product. Regulation is very strict on how and when certain labels can be used on a product. In general, food labels are overseen by the U.S. Food & Drug Administration. However, meat, poultry, eggs and produce as well as organic labeling is overseen by the United States Department of Agriculture. It’s national nutrition month and a great opportunity to learn how to become an educated buyer. Asking questions about your food is one way to begin the process of ensuring you’re buying what’s really good for your body. Some common food terms are vague in nature — partially to protect proprietary recipes or mixes, while other food claims are meaningless. Learning some of the common terms and the official definition according to the FDA or USDA can help you make more educated decisions while shopping. can be used to label anything that doesn’t contain artificial or synthetic ingredients, meaning the food purchased should not have any additives which would not normally be present in that food. It does not, however, mean the food is free of pesticides, pasteurization or irradiation. “Natural” also does not convey health benefits or nutritional value. Due to consumer petitions, the definition of “natural” is under review by the FDA. The public comment period on how to define “natural” and its use in food products is open until May 10, 2016. After that time, the FDA may make a ruling on the use of “natural” on food labeling. According to the USDA, the definition of “natural” is no artificial ingredients or colors, and the product is minimally processed (processed so the product isn’t fundamentally altered). The USDA also requires a statement explaining the meaning of the term on the label. Bisphenol A, a structural plastic component, is applied to food containers to help protect food from coming into contact with metal or leaking out of a bottle. According to the FDA, the levels of BPA contained in food containers and packaging is safe for human consumption (through exposure to the packaging). A BPA-free bottle will not include Bisphenol A in the bottle. This term, used primarily for poultry, simply means the chickens had access to the outside. It does not mean the poultry were raised outside. In fact, the poultry may never choose to go outside. All poultry raised for meat are raised cage free. Poultry raised for eggs are generally confined to cages. Cage-free eggs means the hen had room to roam, usually indoors unless the hen is also free range. Foods with “healthy” on the label must meet criteria for the amount of fat, saturated fat, cholesterol and sodium as well as a minimum amount of vitamins, minerals and other nutrients. The FDA approves certain hormones for use in the excelled growth of certain meat-producing animals. These hormones are regulated as to when, and how, to be administered. A product which is hormone free simply means hormones were not administered to the animal. Hormones used may include estrogen, progesterone and testosterone, as well as synthetic versions of these hormones. Hormone use on poultry and pork is prohibited. Normally found in breads, this term simply means multiple grains can be found in the food. The grains are not necessarily healthy whole grains. Certain items which are derived from any natural source can be labeled as “natural flavor” or “natural flavoring.” The ingredient is extracted from the natural source, possibly enhanced, and added to the new food. There are many uses for natural flavor, varying from enhancing flavor to adding nutrients to improving freshness. The term “organic” is overseen by the USDA Agricultural Marketing Service National Organic Program. The organic label can only be used on products which support the cycling of on-farm resources, promote ecological balance and conserve biodiversity. Synthetic fertilizers, sewage sludge, irradiation and genetic engineering may not be used on organic farms. The USDA-certified organic seal will certify that a product is at least 95 percent organic. Any product with fewer than 95 percent organic ingredients cannot use the seal. When used on packaging, the term “whole grain” means the product includes the entire grain — the bran, germ and endosperm. The proportions of the grain used must coincide with the ratios found in the grain — the amount of bran used must be in ratio to the intact grain. If any of the grain is removed, such as the case with pearled barley, the food cannot be considered “whole.” Most producers will label “whole wheat” or “brown rice” or “whole oats” if that specific grain is used. Which peppers do you choose? That decision is up to you. Hopefully these definitions will help make you a savvier consumer as you make your shopping trips this year. Consult your physician, or a dietician, for specific food-related questions. For the official definitions and other food-related terms, visit the FDA and USDA websites. 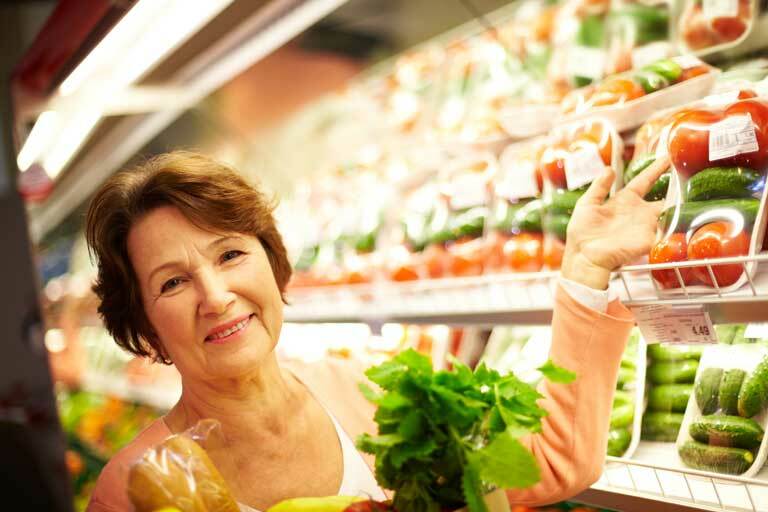 To learn about how Century Park Associates caters to our senior population’s dietary needs, check out our dining services page or contact your local Century Park community to find out more.